Recently caught a 30.9 ounce Grass Carp in a local river chain here in the great state of North Carolina, of the Yadkin River/Pee Dee River system. The fish was caught at around 11:00 am this past Saturday, using a simple bread pack bait flavored with strawberry kool-aid sugar pops for pickups. Using a two hook rig method, the baits were casted out on 3 separate rods in a 10 foot area at about 75 yards out. I noticed bubbles in the area, this letting me know some type of fish was feeding. The fishing rod made a screaming sound as drag was being pulled from the Abu Garcia 6500 reel. I quickly set the hook and the fish put up a great fight! After 15 minutes of a rod bending, drag screaming battle... the fish came in. And this is not a personal best for myself, but a great fish at 30.9 ounces!! I understand these fish will grow quite bigger and some have been caught in excess of 60+ pounds. 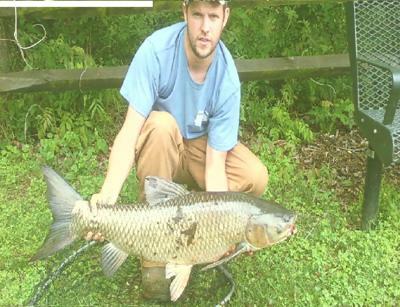 Carp are an over looked species of fish that put up quite a battle and can be very fun to catch. Grab a rod and give it a try! I'm an avid carp fisherman and will continue to do so in the future!